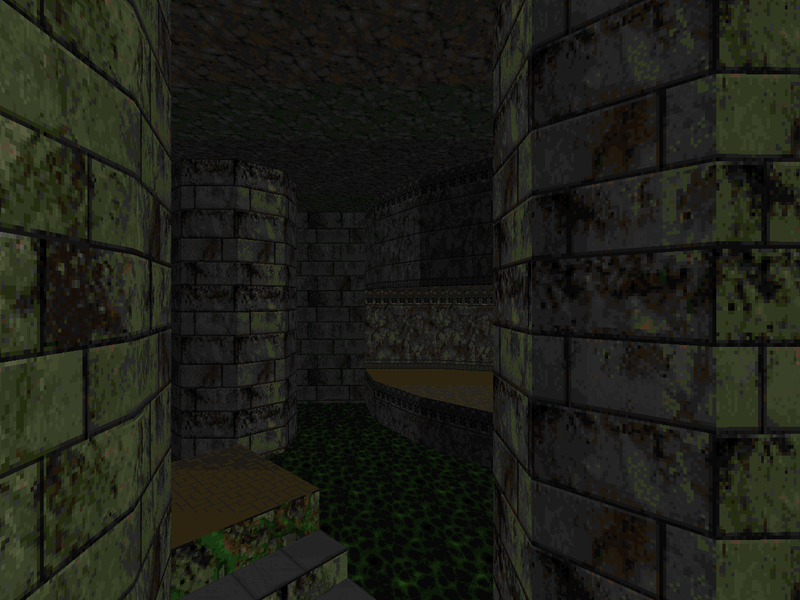 Crossing Acheron is a replacement for E1M3. In comparison to Dante's Gate, v.1.666 is much more thematically consistent, focusing almost exclusively on green marble. 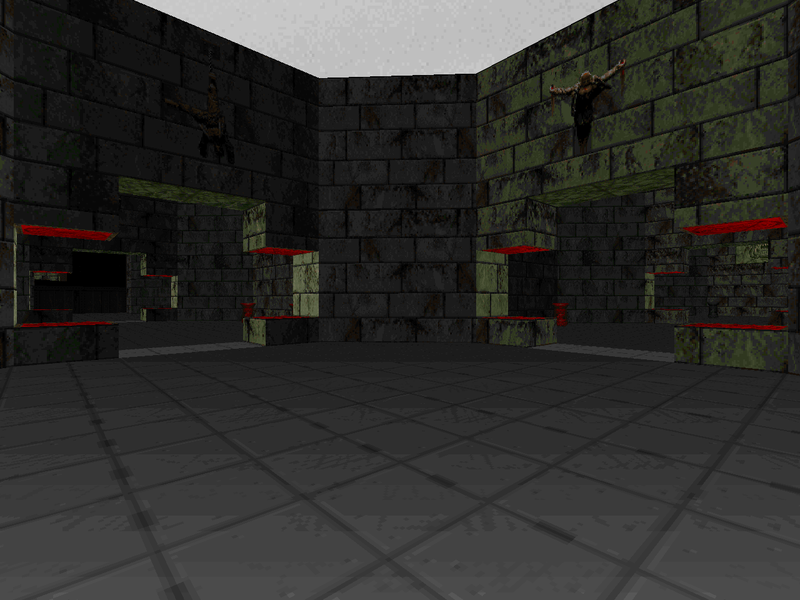 The architecture is grand and a bit more open with some nice features, starting in a Hellish temple with pews and a sacrificial altar - not the only altar to be found. You begin having already alerted three demons but there's plenty of room to run around and scads of ammo, so no worries. The only thing that really counts against the level is that it's overwhelmingly flat, but that's really a vagary of Anderson's. 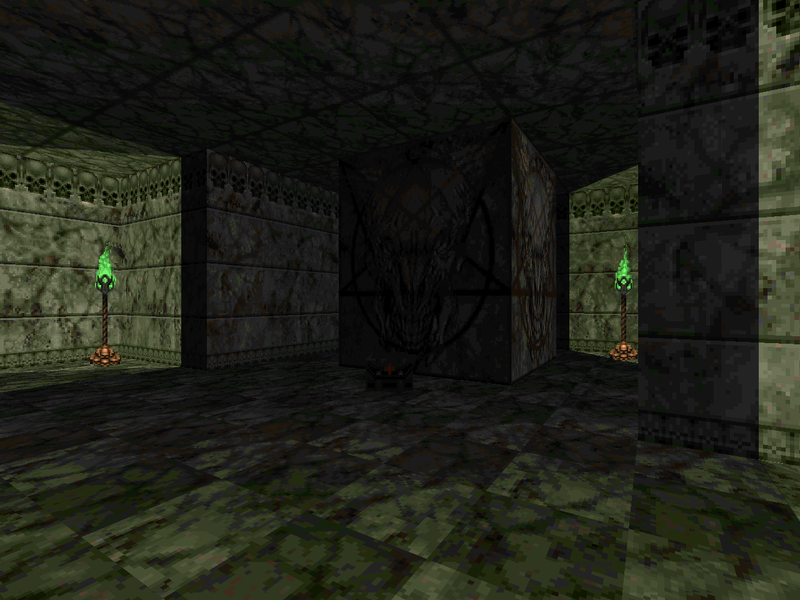 The northwest section of the map, which houses a number of teleporters, is constructed almost entirely out of octagons. Indeed, looking at the automap, octagons are a running theme. Despite the use of teleporters, it's not very confusing, and the most dastardly things Anderson throws at you are shotgun snipers behind false walls and a couple of elevators that turn you into demon chow. The only real standout encounter in my mind is the penultimate room which features a couple ambushes, namely two barons on descending pillars that become part of the exit puzzle. There's only one secret here, and it's the room housing the BFG and rocket launcher. You'll need a key to get in, not that you'll know at first sight. Really, you won't even need either weapon. The shotgun is more than sufficient for most encounters, there's not a lot of ammo lying around for the chaingun, and the plasma rifle is pretty easy to come by. The map is made even easier by a couple combat armors and while the health isn't exactly overflowing, a couple berserk packs and a soul sphere make sure you're rarely under pressure from the map's 94 monsters. 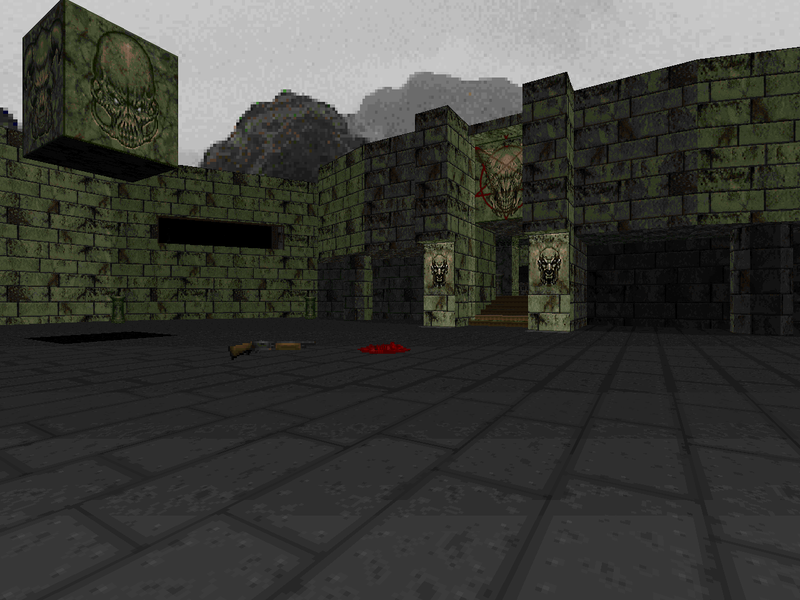 The Doom II version is essentially the same map with a few Doom II additions. Only the chaingunners and revenants feel well-used here. The mancubus and pain elemental feel more like afterthoughts than anything and you can easily deal with the arch-vile from the other side of the window. There's also two megaspheres in addition to most of the powerups from the previous edition. The biggest change map-wise is the lighting. I know Dante's Gate had a big change in lighting done, but given that the textures between Acheron v.1.666 and v.2.2 are nearly identical, the shift from plain to wonderful atmospheric lighting is quite palpable. It's worth playing the map alone for this, and who really cares how easy it is when there are so many Doom WADs out there whose sole selling point is high difficulty? Crossing Acheron is thematically a much tighter map in architecture, aesthetics, and encounters than its older brother, Dante's Gate. 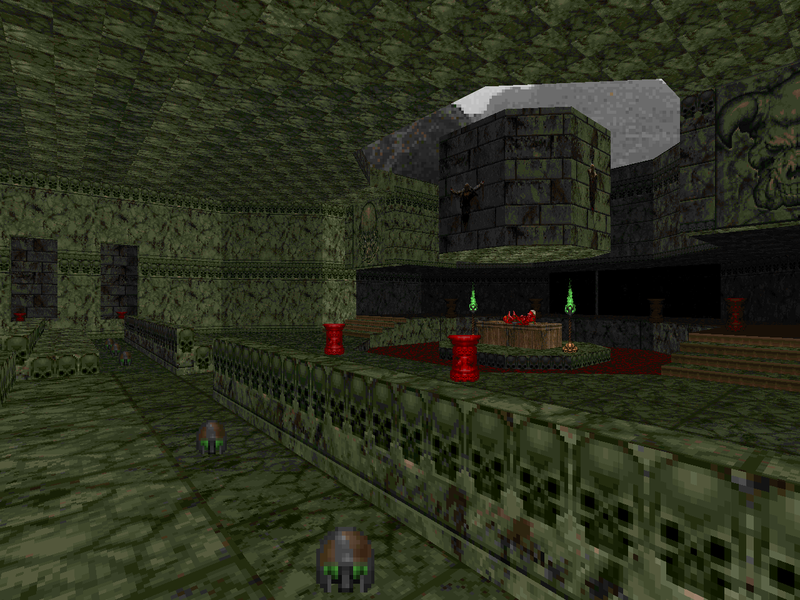 It's pretty short and easy but it's a great romp from '94 and the Doom II update oozes style with the lighting update. In terms of sheer fighting, I'd pick Dante's Gate, but the aesthetic qualities of Crossing Acheron pull it ahead when considering a showcase of Anderson's mapping style. Like every other Doomer, I'd also like to see Lethe released sometime before I die of old age... but I think holding our breath while waiting for that one would probably be a bad idea. 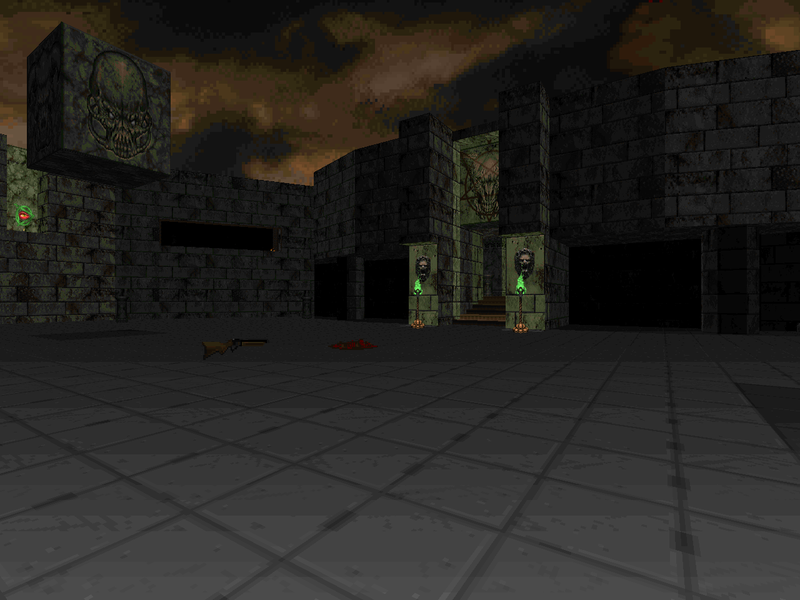 The Doom II versions of this map and Dante's Gate were done partially to make them fit the theme of the later levels of the series (his Master Levels, primarily). I dunno where you got the red / orange sky from, probably PSX?